Just came back from presenting at the Belgian TechDays in Antwerp, Belgium. The conference was held in the Metropolis cinema complex, which meant HUGE digital-display screens that showed the slides on the right and a close-up of the speaker on the left. This was one of the best breakout-session setups I’ve seen in a long time. My first talk was at the pre-conference. 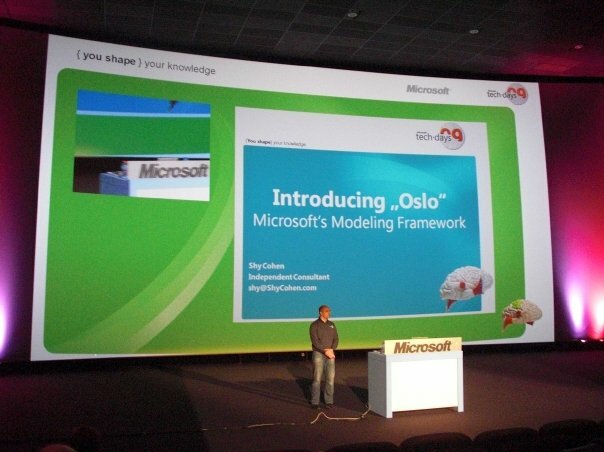 It was an Architect-oriented talk about Oslo and modeling. I talked about software modeling in general, showed the Repository and how it works, and gave an overview of the M family of languages and its accompanying toolset. My second talk was at the conference itself. It was a Developer-oriented talk that focused primarily on modeling with M. The talk consisted mostly of demos: defining data structures and instances with M, creating a DSL and using it to generate instances, and using an interpreted DSL to drive a runtime without first putting the data in persistent storage. As I understand it, the presentation videos will be posted online by Microsoft Belgium. Once they are, I’ll post the links. I’d like to take this opportunity to thank the Belgian team for their wonderful hospitality – it was my first time in Belgium and I’m already looking forward to coming back. Hi Shy, I was at your first presentation at techdays and really appreciated it. Thanks. When will you make the related files available : the presentation, but more importantly the demo files, the "conference rooms" language files, ... ? Sorry for the slow response - I was attending MIX09 and was slow on mail. I'm glad you enjoyed the session. I will post the decks shortly. I will also post the code, with explanation, as part of blog series.